The products at sympathyplaques.com are all made in the USA. Each item is made of cast stone and finished by hand. Variation in the finish from item to item is expected and is a part of the hand finishing process. Our products are designed for outdoor or indoor use. Please see our Product Care page. 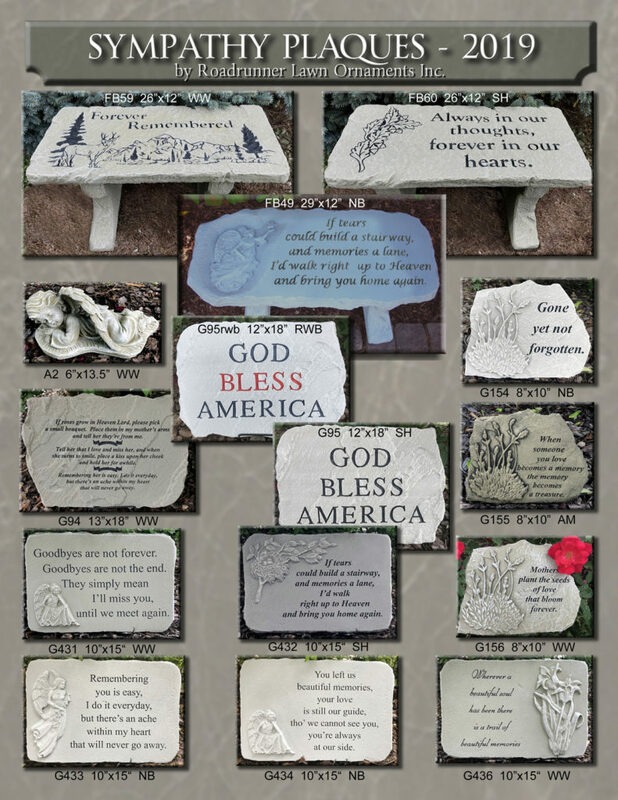 Most of our products are designed for memorial gardens, grave sites, or as a memorial to a loved one that has passed. However, we also have several items that will make great gifts for mothers, fathers, and those other special people in our lives. Retailers who have registered with our site can view the product line with wholesale prices by clicking on Shop Online or the Pallet Program tab on the menu bar or by choosing one of the product categories from the drop down menu. If you are logged in you will see the wholesale price. Users who are not logged in will see the retail price.